Life on a sailing vessel in SE Asia from April to September is dominated by the SW Monsoons which are characterised by hot humid days punctuated by heavy rainfall, strong winds and lightning storms. So, after the intensive sailing of last year when we left Brisbane in April, covering over 7,000nm via Darwin, on through Indonesia to Singapore, Malaysia and Thailand, we decided that the off-season was a good time to do the land thing. This turned out to be a fairly even split of three two months slots. The first in the UK catching up with family and friends in March and April, not a good time to be in England! May and June were spent in New Zealand, enjoying the company of family, helping out on their dairy and goat farms whilst also visiting friends in the North and South Islands met during our three cyclone seasons there. 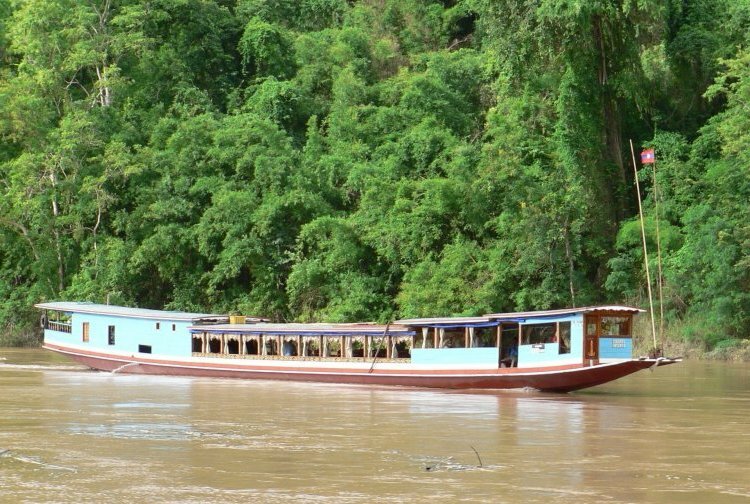 Finally in July we set out on an ambitious land tour from Langkawi in Malaysia, where Amoenitas was berthed, through northern Thailand to Laos, Vietnam and Cambodia. It is the tale of this trip we have for you now. This has probably been the most difficult of all the Updates to compile, as there is so much to tell and so many images to draw from. 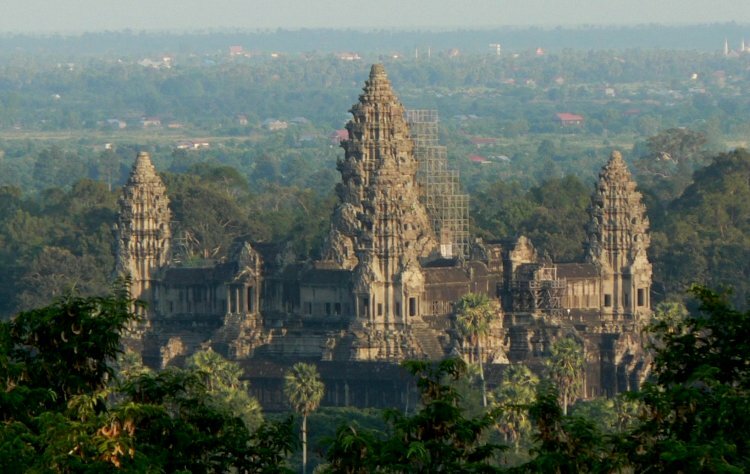 Dave took 2,089 still pictures in eight weeks, nearly 800 at the Angkor Wat temple complexes in Cambodia alone. The choice has been agonising but here is a selection to give you a feel for our tour. In order to shorten the main story we have gathered all the 'people' related images in the page we used to show our Latest News. This can be accessed from the foot of the Homepage, via a link to 'Archives of previous Updates', 'Peoples of SE Asia' and 'Marine' pages. We will indicate a link to this main text by a note : See 'People'. 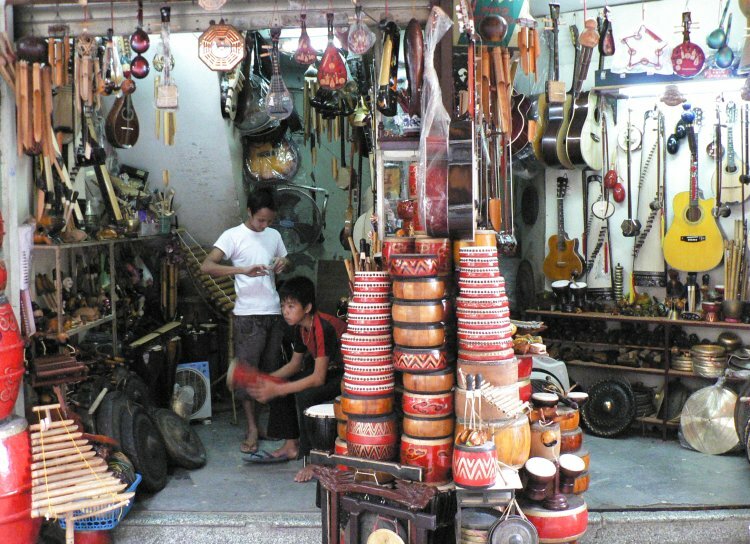 Bangkok is a vibrant city that everyone seems to enjoy and we were no exceptions. The 'we', by the way, are ourselves plus David & Heather from Milliways, another pair of Brit cruisers we first met in Scarborough marina in Oz. We travelled to Bangkok from the marina at Rebak, an islet off Langkawi, by rail on a night sleeper from Butterworth on the Malaysian mainland near Penang; that was after two taxis and two ferries. At the outset we should point out that this whole region has been the subject of strong religious influence for around three thousand years, coming mainly from India. The monuments that remain are therefore either temples or burial sites since the homes and palaces were constructed mainly in timber and have largely been lost. 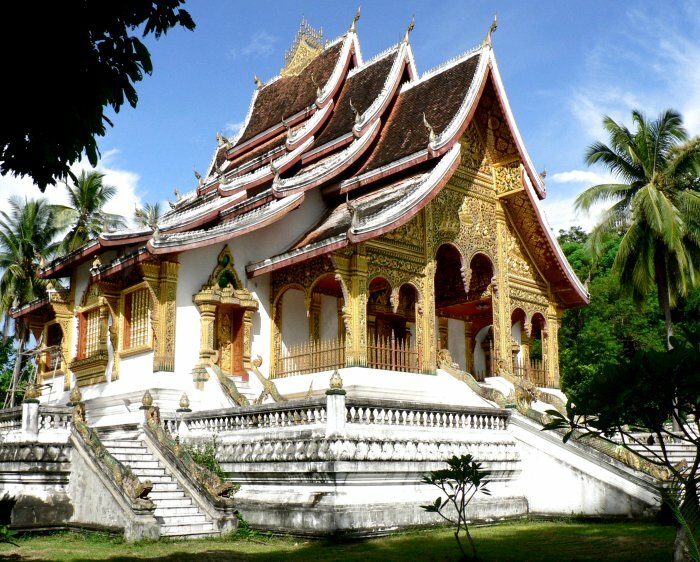 The local term for a temple is 'wat' or 'vat' in Laos whilst a religious burial structure is called a 'stupa' or 'chedi'. "We will tell you this just once!". Many of the images here will reflect this ancient religion stance but we will do our best to leaven the tale as much as is possible. 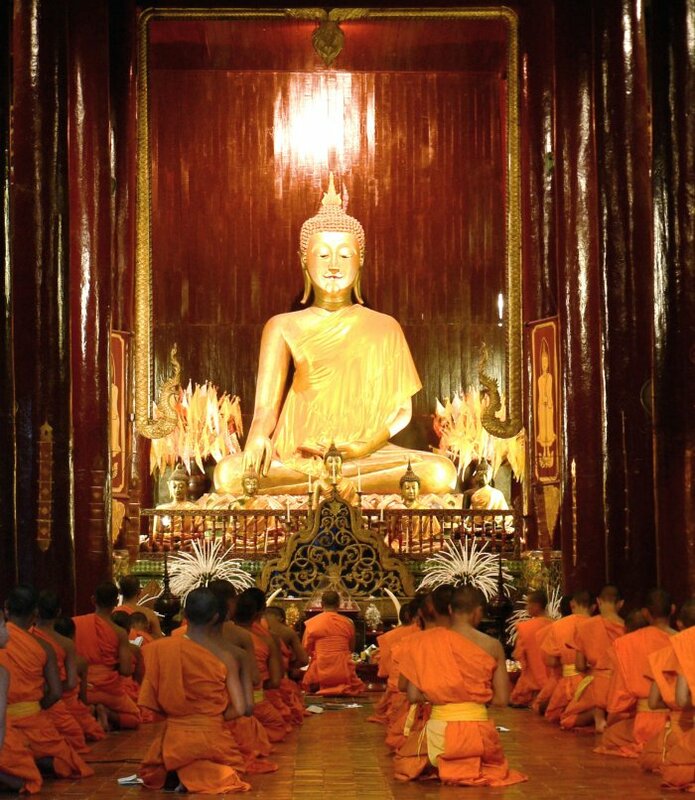 Not surprisingly therefore, our week in Bangkok set what was to become the tone of our journey, lots of wats interspersed with stupas, museums and the occasional performance of traditional dance and music. Heady stuff! 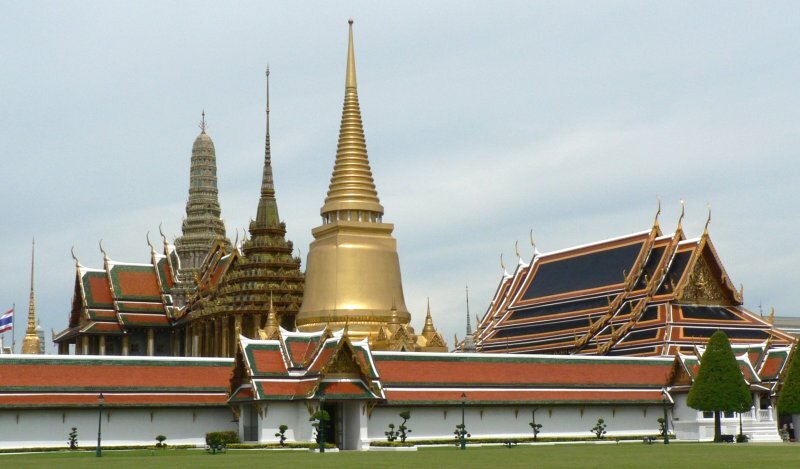 Construction of the remarkable Grand Palace and Wat Phra Kaeo site began in 1782 to mark the founding of a new capital and to provide a resting place for the sacred Emerald Buddha. 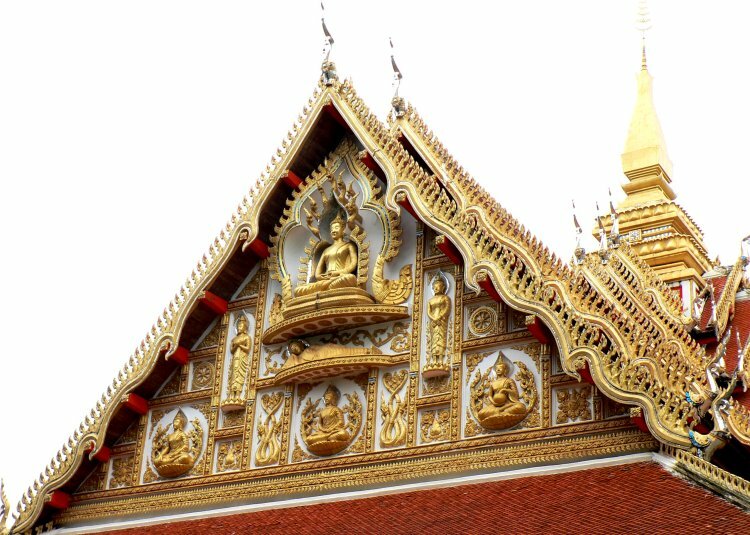 In the centre of the picture above is the golden Phra Si Rattana Chedi. This contains what is said to be a piece of Buddha's breastbone. To the right is the Temple of the Emerald Buddha, the most important monument on the site. Like virtually all wats it sports a beautiful, steep, tiered, tiled roof and is lavishly decorated with lots of gold leaf and paint. The tall, pointed structure behind the stupa is the Phra Mondop library and beyond it the Ho Phra Monthien Tham, an auxiliary library. 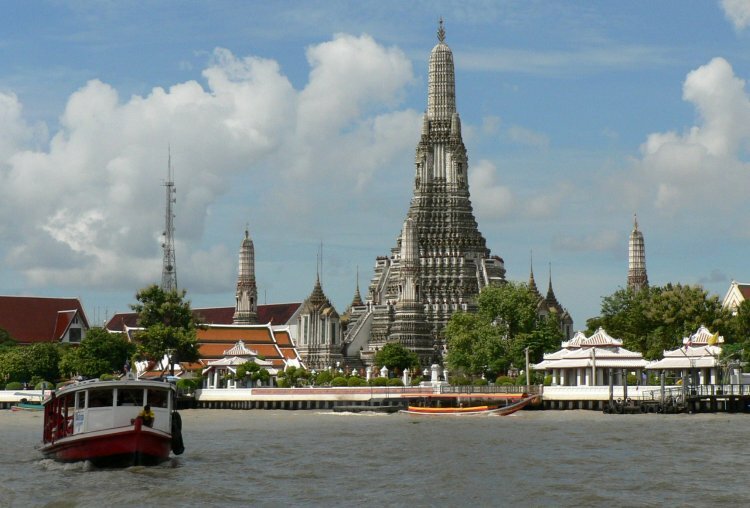 The large grey tower in the background looking like a smaller version of Wat Arun's central tower is one of eight prangs that border the east side of the complex. The building above is a splendid example of wat architecture but paradoxically is not a temple but houses the exceedingly ornate funeral carriage that the Laosian kings used on their final earthly journey. Note the crowning cluster of ascending golden spires in the centre of the roof which is another feature which denotes Royal patronage. The most ornate decoration is reserved for the front upper side of the building and the doors. 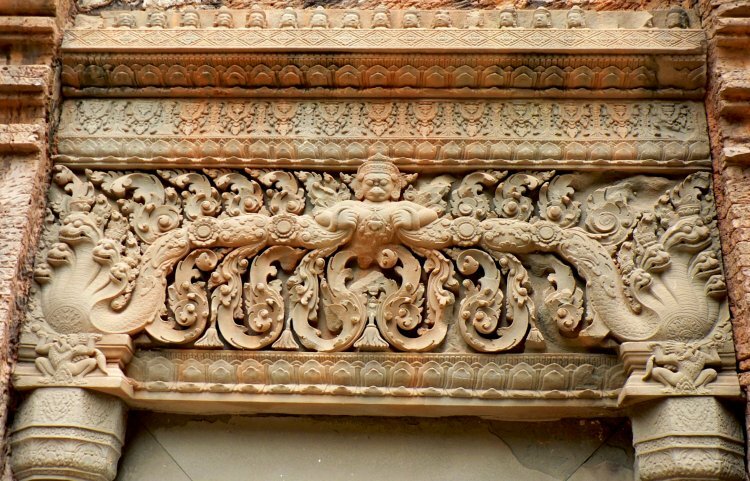 Another good decorative example below is from a 'lesser' building within the Wat Faun complex in Vientiane, Laos. 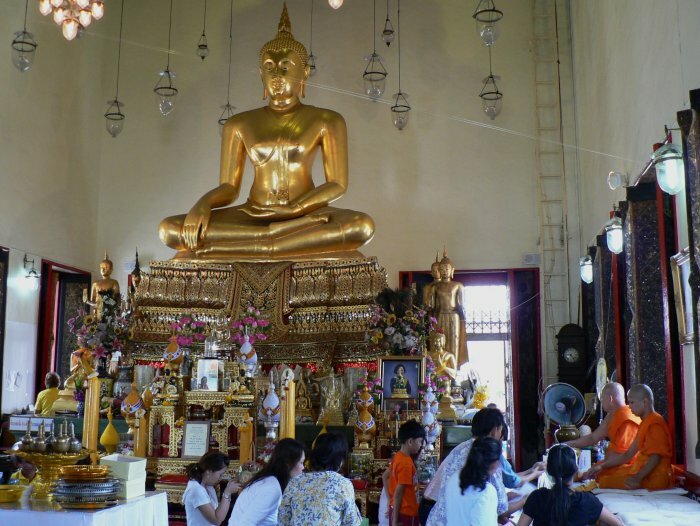 Within the wats are Buddha images such as the example below known as the Golden or Smiling Buddha at Wat Buranasri in Bangkok. This 4m high, 13th century statue is made of 18-carat gold weighing five tons. It was discovered by accident in 1955 whilst extending the port of Bangkok. The plain stucco figure was stored under a make-shift shelter at the temple for 20yrs until a crane fell on it, cracking the plaster and revealed the gold Buddha beneath. Images of Buddha come in every shape, posture and material imaginable, there are statues for each day of the week and large reclining examples are particularly favoured. 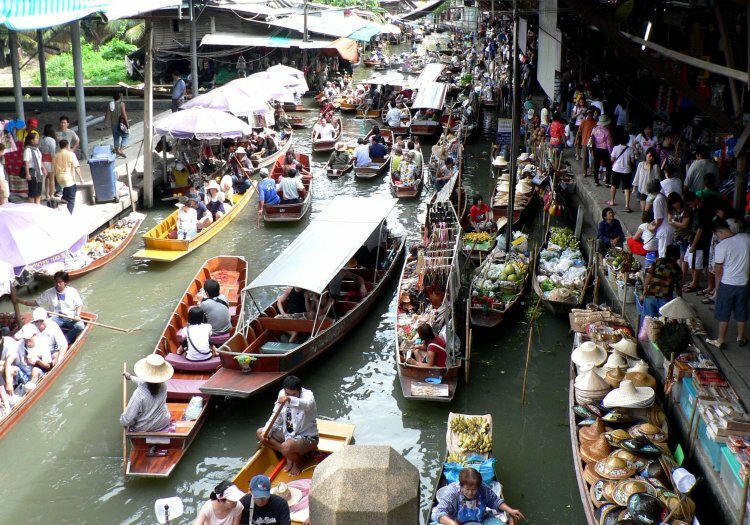 Around 75km to the north of Bangkok on the main road to Kanchananburi is a region of waterways that harbour so called 'floating markets' which whilst full of bustling local colour are nothing other than crude tourist retail traps, resplendent with the most awful tat. Thankfully, these are places we find it easy to resist with the limited storage aboard Amoenitas. Onwards beyond Kanchananburi we visited a tiger temple at Wat Pa Luangta Ba Yannasanpanno where we had an opportunity to get to stroke these enormous cats in their post luncheon torpor, or were they drugged? We also stopped off at the Bridge over the River Kwai evoking memories of the film with David Niven and Jack Hawkins, yet another a place neither of us ever thought we would get to see. 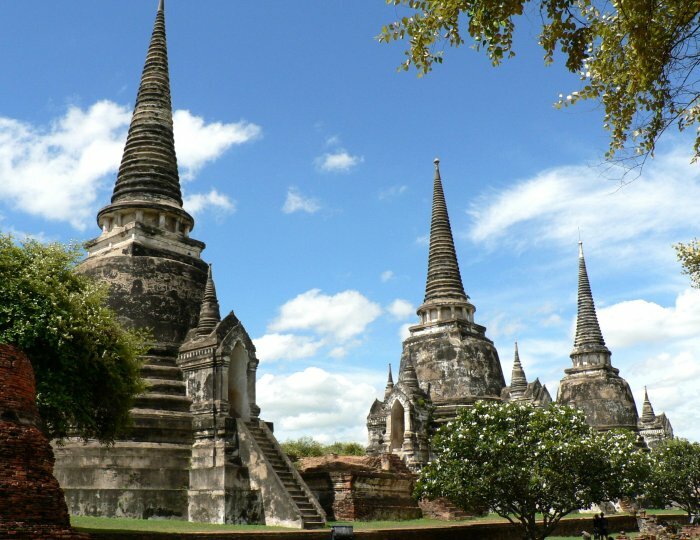 Our route north from Bangkok was via the previous ancient capitals of Ayutthaya, Chiang Mai and Chiang Rai employing a mixture of night sleeper rail and coach journeys as distances dictated. The site of the Thai capital city had been moved progressively south over the centuries, probably for reasons of security in the almost constant and bloody rivalry with the Burmese. Ayutthaya about 2hrs by train north of Bangkok had been the last capital for many centuries and is littered with magnificent religious sites. We hired a tuk-tuk and had an wonderful, if rather hot day of 'wating' and 'stupaing' before boarding a night sleeper for Chang Mai, yet another former capital. In the National Museum at Chang Mai we learnt of the continual wars that had ravaged the area for centuries, usually coinciding with the emergence of a new leader or warlord. The principal struggles seemed to be between Burma (now Myanmar) and its traditional sparring partner Siam (now Thailand). Later we were to learn that Cambodia had a similar uneasy relationship with the Cham peoples of what is now Vietnam but in general the whole area was open for acquisitive aggression. In Chang Mai we fulfilled a recently acquired ambition by having fun attending a Thai cooking course. It was a full day, beginning with a trip to purchase ingredients at a local market, then cooking and eating five classic Thai dishes, as well as preparing a hot green chilli paste. If you are interested you could access the school's website - www.baanthaicookery.com (we attended on 24th Aug if their pictures of our exertions are still posted). Also see our 'People' page. We stumbled across the monks in prayer below as we passed by the temple close to our hotel at the end of a long walk taken to work-off some of the excellent food we had prepared and consumed. 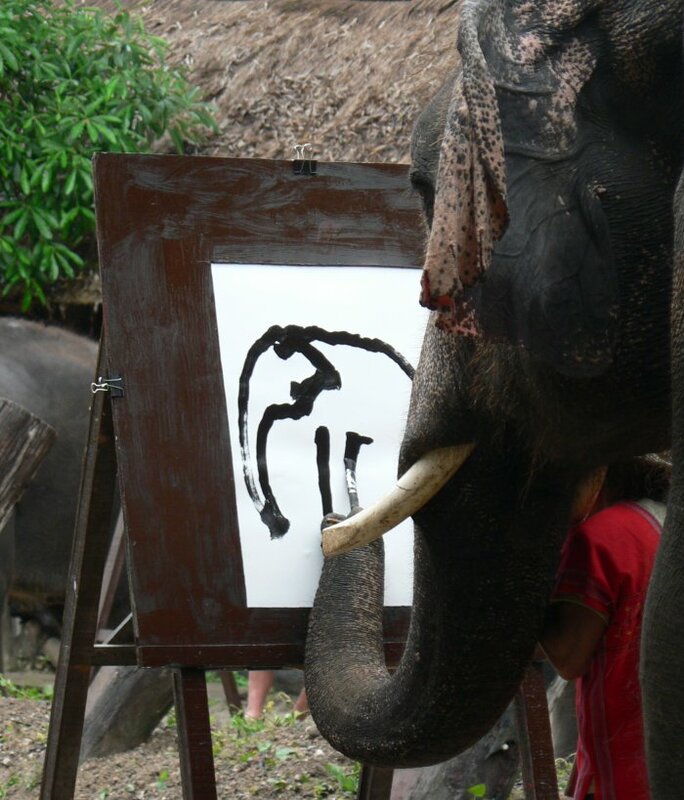 We took a trip about 100km north of Chang Mai to an elephant sanctuary where we were treated to an amazing display of tasks and tricks performed to order by these obviously very intelligent creatures. These included painting, playing soccer & basketball as well as all the usual things like transporting and stacking logs. What a great opportunity to make an action packed video for our three grandsons but at the same time yet another occasion when we wished we could have had them there beside us to experience it in the live. We also got to take a bullock cart and ride with two us atop an elephant with a driver. This was not a perfunctory ride but took over an hour, crossing rough terrain and fording two substantial fast flowing rivers. Finally, the four of us sat atop a barely floating bamboo raft for a leisurely trip of around 10km downstream. Further north we encountered many examples of ethnic minorities who had filtered across the border from Burma or China which were usually referred to as hill tribes. One of these, the Karen people, still preserve the custom of female neck rings, though the motivation has now become pecuniary for tourism rather than to preserve what is a seriously inhibiting custom. An adult woman's coil of brass can weigh over 5kg with arm bands adding a further 7Kg and they begin applying them on girls at the age of three. There were plenty of photo opportunities to be had observing these peoples in northern Thailand and Vietnam so they feature prominently in the 'Peoples of SE Asia' page (accessed through the link to 'Archived Updates', etc). 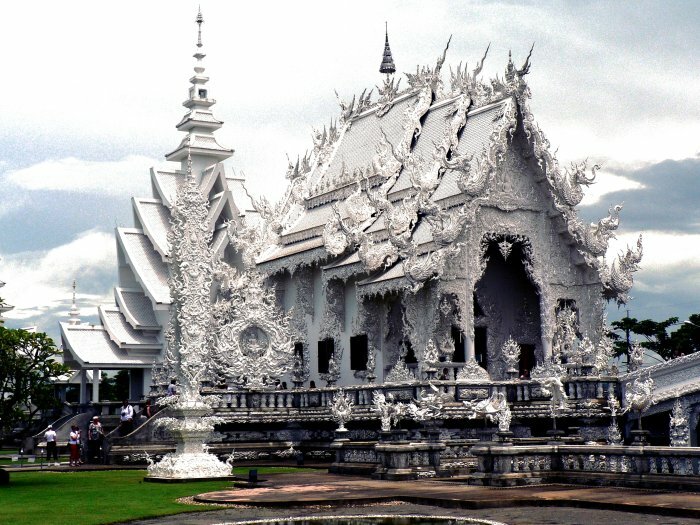 Outside Chiang Rai, yet another ancient ex-capital in the very north of Thailand is a complex of religious buildings called Wat Rong Khun but known as the White Temple. This is where the King is having the 9th and final temple of his reign constructed. You can see it is distinctive, not only in its colour but also for the extremely sumptuous (over the top) decorative detail. The internal decoration is still incomplete but a striking, almost finished mural on an end wall has the most vivid and unexpected allusions. Amongst the warplanes, rockets, ICBMs, etc are likenesses of George W Bush and Osama bin Laden facing eachother. How appropriate. 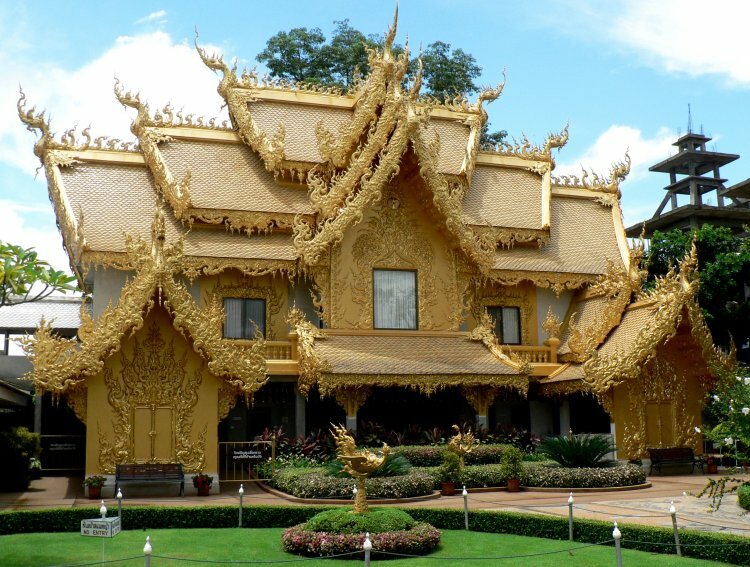 The extensive grounds of the temple were littered with the most ornate statues and structures including the gold building below that gave the appearance of being an up-market guest house. After 12 days in Thailand we had worked our way up country to a latitude of just over 20° north, within striking distance of the border town of Chiang Khong which is on the mighty Mekong River, adjacent to Laos and also close to the borders with Myanmar (Burma) and China. Next day we took a bus to the border and began a most unusual journey by boat. We crossed the border on the Mekong River (local name Nam Khon) to the Laosian town of Hauy Xai to board a 'slow boat' for the two day trip down river to Luang Prabang. As it was the rainy season, the vessel was benefiting from a strong downstream current which sped us along through the milk chocolate coloured waters at around 14.5kts ( we has a hand held GPS and map with Lat/Long). On the first day the boat was crowded, mainly with back-packers so we were pleased to arrive at the sleepy and very muddy town of Pak Beng for the night. The ancient city and past capital, Luang Prabang is sited at the junction of mighty Mekong with the Namkhan, itself more than 200m wide. It is a magic place of old French colonial charm, good food and splendid vistas from Phousi, the local hill. Below is the view to the south with the Namkhan tributary on the left with the central part of the town behind us. 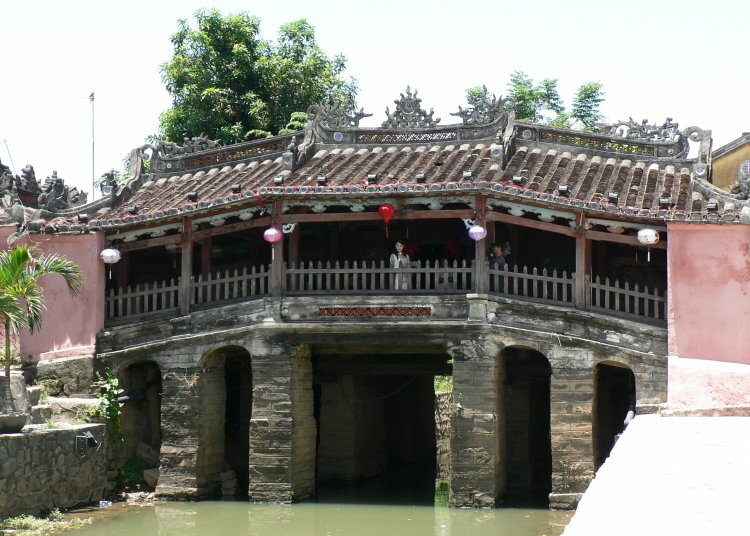 The famous Vat Xieng Thong on the narrow isthmus between the rivers dates back to 1560 and is a centre of Buddhist learning. It was there that Dave went at around 05.40 on each of the three days we were there to discretely observe and film the a giving of alms to the student monks. Around a hundred of them would gather outside their hostel within the temple grounds, forming into a column of descending seniority before filing past a line of up to 25 local people who placed gifts of food into their bowls. This done they trouped around the streets of the town collecting more arms before returning after around an hour, for what was probably a big share-out. To see pictures of monks and this traditional donation of alms, check out the 'Peoples of SE Asia' page. Luang Prabang had to be one of the most attractive stops of the whole tour, so it was with some regrets that we set out by car for a full day's drive to Phonesavan to the NNE. This was definitely one of those journeys that can't be measured by looking at the separation on a map as the route was exceedingly mountainous with tortuous climbs, descents and continual hairpin bends. 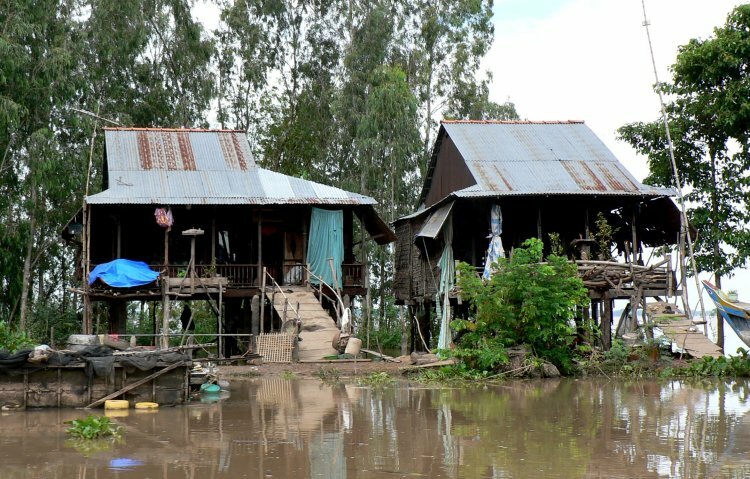 Nevertheless, it was a wonderful opportunity to see the real Laos and how people lived in bamboo houses on stilts, clinging to the pecipitous hillsides. We reached Phonesavan which comprises one long street in the early evening, accompanied by a torrential rain storm. 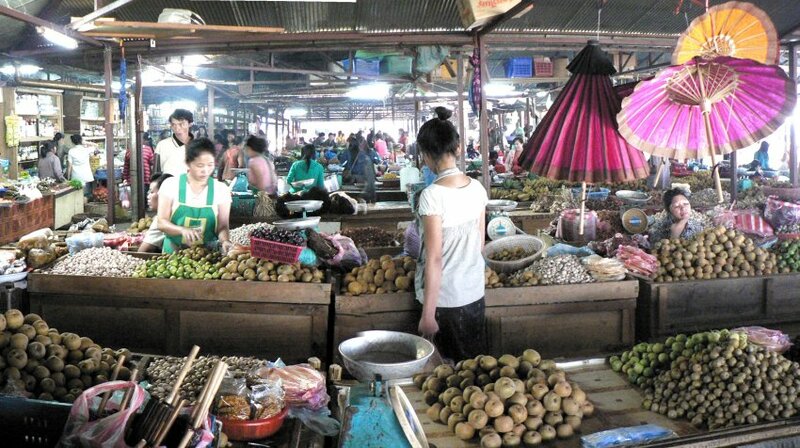 Early next morning we visited the thriving local market packed with every type of food imaginable, as well as many we had never dreamt of seeing! 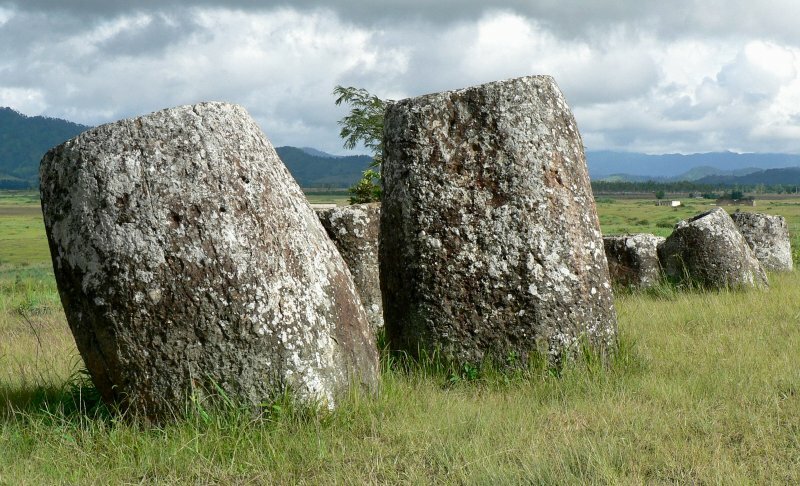 We had taken this detour north to visit the famed Plain of Jars where huge ancient stone vessels of unknown purpose, age or origin litter the countryside. First though we had to learn about some of the dangers that threatened us, as they have threatened the Laosian people for over 30 years since the USA's war in Vietnam which flowed over into Laos and Cambodia. To do this we visited the local MAG (Mine Advisory Group) office in town to see the displays and watch a film on clearance activities undertaken by this international charity group. 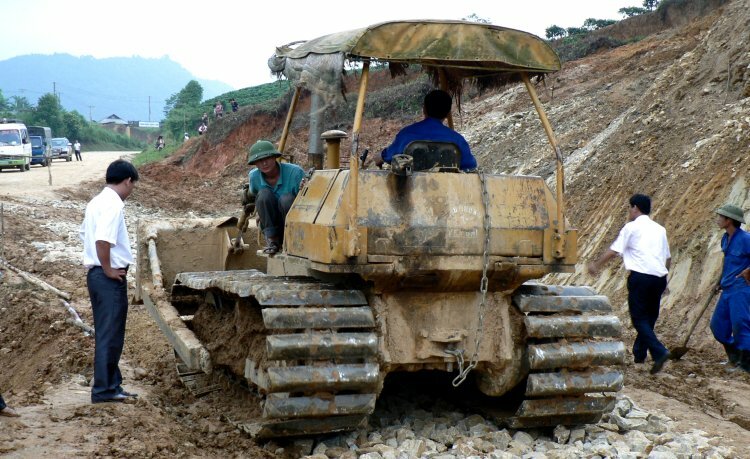 US bombing data provided in 1997 showed that 1.36 million metric tonnes of ordnance was dropped on Laos between 1965 and 1973. Amongst this was 250 million anti-personnel sub-munitions. This is equivalent to 12 tonnes/sq km or half a tonne for every person in the country! 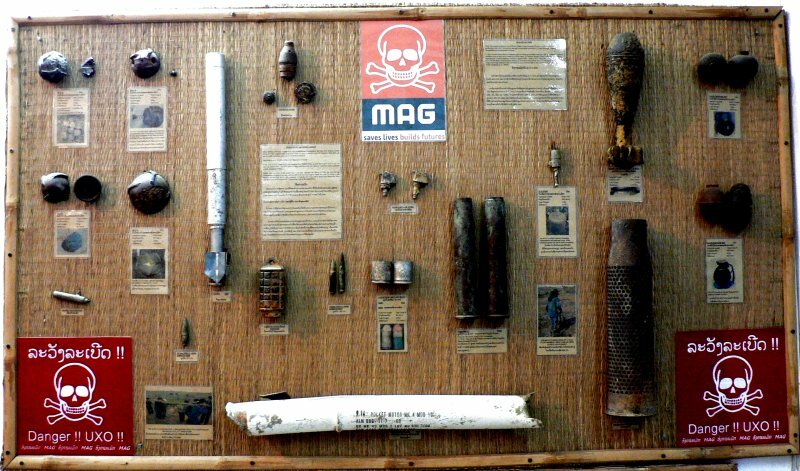 This UXO (un-exploded ordnance) is still dangerous with around 300 people still killed every year and many more mutilated. It also means that much of the agricultural land is still too dangerous to cultivate. On our tour of the area we had to remain within the confines of white concrete markers set in the ground by MAG to delineate cleared areas. The United Nations has worked hard for decades to outlaw the use of cluster bombs and anti-personnel mines. Though almost all nations have signed-up to these initiatives, their efforts are nevertheless frustrated by China, Israel, Russia & the USA. At the Plain of Jars we visited three major sites where we saw around 500 large jars up to 2.5m in height. There is no historical data on how, when or why these substantial vessels had been constructed. The best estimates suggest they are around 1000 years old, being fabricated using sand with slithers of buffalo hide and a binder rather than carved from the solid. It is thought they were used as burial containers or maybe for storage of food. The jury still seems to be out on this one. Meke, our guide, had good local contacts so we persuaded him to call in at a village known to produce 'Lao whisky' made from rice. We bought a litre for 10,000 Kip (60p) but mixed with every fizzy concoction we could summon, it remained unattractive but very potent. We also saw a Russian tank carcass that after all these years was almost totally corrosion free. Finally we visited the remains of Vat Phia Wat in the old Laos capital of Muang Khoun, a temple built in 1590 and bombed in 1959! From Phonesaval we again took to the dramatic Laosian roads on another full day drive to the capital, Vientiane where we again rejoined the Mekong river. There we did the National Museum, saw the national stupa, That Luang and visited the Xieng Khuang statue park. We saw quite a lot of interest but sadly none of it has crossed the threshold for further inclusion into this saga. However, Dave did have a minor run-in there with the fuzz whilst attempting to take video of the visiting PM of Kuwait outside the House of Representatives. This is still a communist country so a hand quickly appeared across the lens! The roads from Laos towards Hanoi, the Vietnamese capital were problematical with no obvious bus service so we resorted to the Laosian Air alternative. Not an exemplary service but eventually we did make it. How can one succinctly describe modern Hanoi? Perhaps as a frenetic anthill of the most avaricious creatures on earth. How this country could ever have been Communist or claim still to be so, we will never understand. Our days there were full of stimuli which included the Ho Chi Minh Mausoleum & Museum, Vietnam Museum of Ethnology, temples and local arts such as the traditional Water Puppets. However, two impressions remain. The traffic, principally motor bikes which appeared threatening without any proscribed crossing points but which magically always found a way to avoid us. The other feature is the corruption and lying to separate tourists from their money. Clearly they believe the war is not over yet and they are justified in using any subterfuge to extract monies from we foreign visitors. Even we boat-bound cruisers were constantly tempted by the wares on offer but getting around the old town on foot presented constant problems. The road junctions were a nightmare and the footpaths were totally covered by motorbikes. All the most basic functions and social interactions were conducted in the streets, outside people's homes. 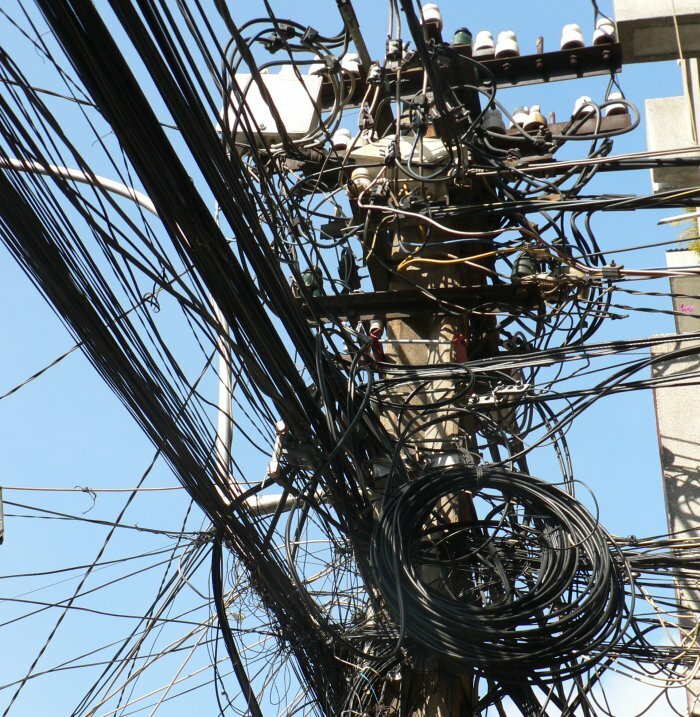 Amongst the most frightening sights to an ex-Fellow of the Institution of Electrical Engineers was the electrical distribution system. 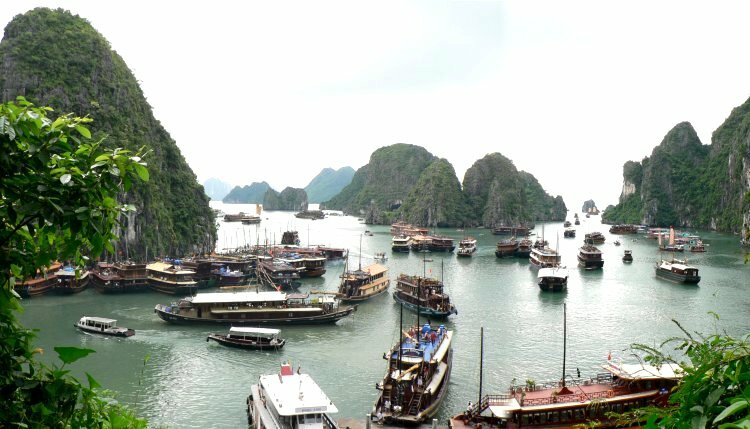 One of the popular tourist haunts on the coast, about 120km east of Hanoi is Ha Long Bay. This is a karst limestone feature, not unlike Phang Nga Bay to the NE of Phuket in Thailand. The major difference is the degree of tourist exploitation. From the image below one can see just how crowded with overnight trip boats this small area of coastline has become. Having said that, we enjoyed an excellent two day cruise with a cabin that far exceeded the comfort of our hotel in Hanoi. There was also the Sung Sot (surprise) cave system from the mouth of which the picture below was taken. This comprised three huge systems that were beautifully lit in multiple pastel colours. We returned to Hanoi from Ha Long expecting to set out next day on the night sleeper train for the old French colonial, mountain retreat town of Sapa, close to the Chinese border in the far north of Vietnam. However, we learnt that the previous weekend's cyclone which passed to the north had caused massive flooding, landslips and killed over 70 people. The rail line to Sapa had been flooded and a train had overturned, so we would have to go by jeep next day rather than on the night sleeper. It will only take 10hrs we were told but Tues 12th of August was Heather's 60th birthday and she was destined to celebrate it on an epic journey. We set out from Hanoi at 08.00 in two ancient, ex-Russian army jeeps driven by two very young, keen but worldly inexperienced lads, speaking virtually no English who started by heading W instead of NNW out of the city thus losing a couple of hours at the outset. Fortunately the hand-held GPS and map with Lat/Long came to our rescue and we able to sort them out eventually. Within about 4hrs we are getting into remote high country on steep, twisting roads with serious land-slips every few kms but so what, we are in jeeps, uncomfortable but tough. In the afternoon we get delayed while a new bit of road is built, a complete 200m section of the old one having disappeared down a steep hillside. From then on it seemed to get ever more dramatic with one slip in a town ending at the doorsteps of the houses. We climbed over that one level with their upper windows about 10m away. We toiled onwards until after 18hrs traveling, at 02.00 when about 4km from our destination we came to a grinding halt at an enormous land-slip. The lads were great, calling one of their brothers out with a van to the other side of the slip. Carrying all our luggage, we crossed around 400m of steeply inclined mud and rock, at times on the very edge of a huge, precipitous drop, arriving at the hotel at 03.15 to an incredulous reception from the awakened reception clerk. The trip we had been sold as a 10hr doddle had become a 19hr nightmare! Next day we emerged into the lobby to be surrounded by hotel staff and tourists who wanted to know how we had got there, they had been waiting to escape for 5-7 days! It seems a train had tried but had taken 3 days to reach Hanoi. We also learnt that the day before two people had hired a jeep just like ours with driver who were stopped by a landslip and whilst waiting were carried away by a rock-fall with all three killed! 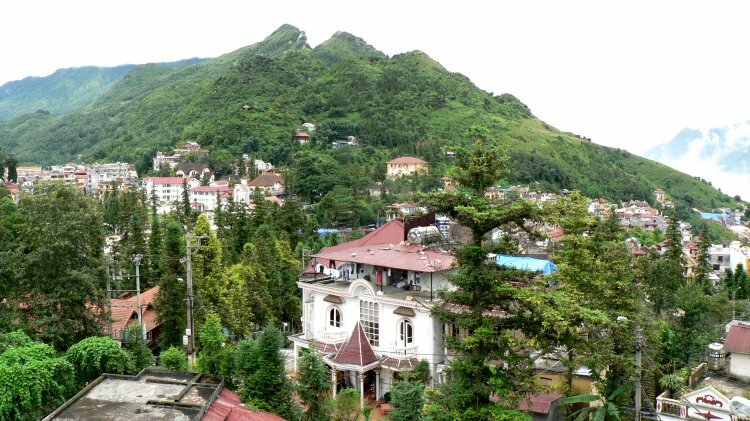 Having reached Sapa, an old French colonial hill station, we were pleasantly surprised by the scenery and diversity of attractions. The bad news was that all the tourists that had been holed-up there for around a week had escaped shortly after we had arrived and none, other than we intrepid jeep travellers had replaced them. So, to all intents and purposes, we were it! It was a great place and the first one since leaving Malaysia where we could survive comfortably without air-conditioning. We met lots of Dzao and Mung hill tribe peoples which are featured in the 'Peoples of SE Asia' page. Below is a view across the town from our hotel. After three days in Sapa we took the night sleeper train from Lao Cai on the Chinese border back to Hanoi for a 12hr stopover before boarding another sleeper train south to the ancient ex-capital city of Hue. Sleeper trains in SE Asia are a good way to cover large distances, as road transportation is much more unpredictable and 'exciting'. 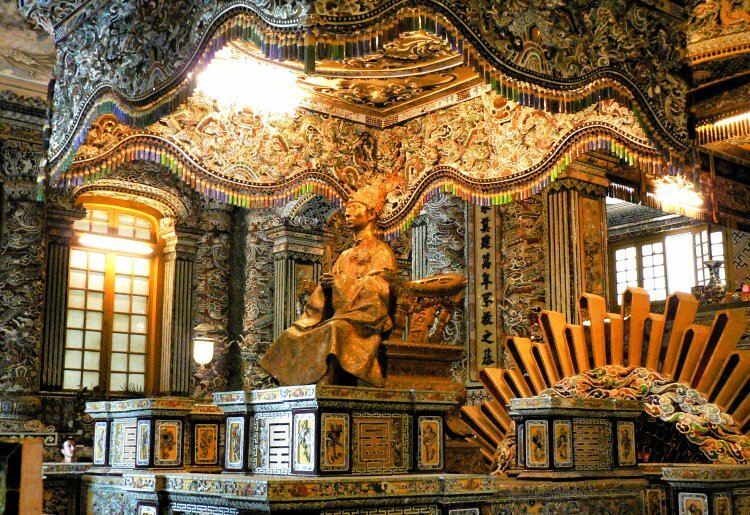 Hue was the home of the emperors from 1842 to 1945, their seat of government being The Citadel or forbidden royal city. This is an enormous walled area, surrounded by moats which took a full, very hot day to explore but was worth every one of the many litres we perspired. 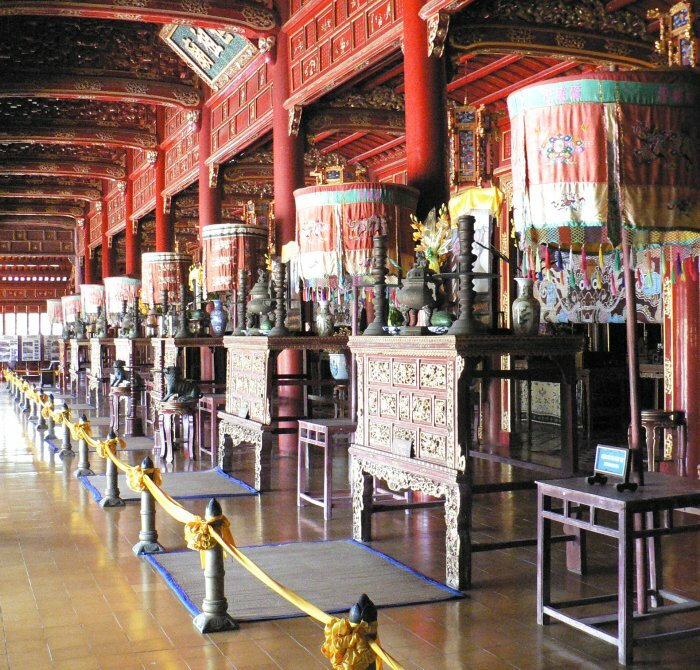 Hue is also surrounded by large palaces which house the tombs of rulers past of the Nguyen Dynasty. We visited several of them by hiring a car and driver for a day. By far the most impressive was the Minh Mang Palace, resting place of king Khai Dinh which occupied several levels of a steep hillside. 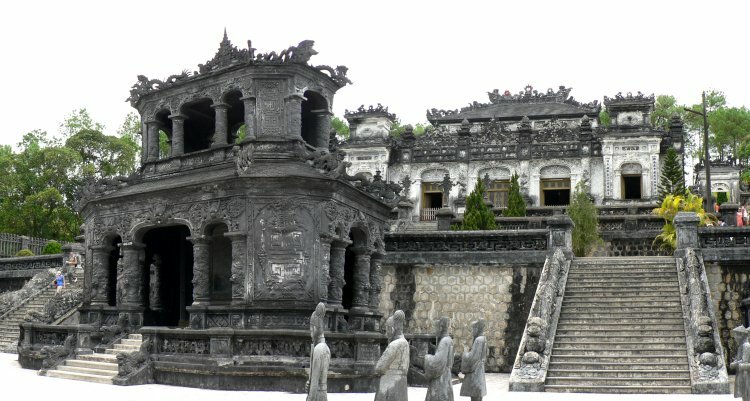 It was notable as one of the first Vietnamese monuments to have been constructed entirely of concrete. This was an amazing place blessed with superb views across the open countryside, together with the decorative splendour accompanying the tomb of King Khai Dinh below, the ornateness of which almost defies description. From Hue we moved south to Hoi An by bus, not the most comfortable or re-assuring mode of transport in Vietnam. The discomfort was well rewarded by arriving in a charming riverside town on the coast, with masses to see and do. Not the least of which were the renouned tailors who could conjure up garments in silk or cotton overnight. The girls were agog and even we males were tempted to buy the odd garment or so. Below is the famed Japanese bridge. The girl looking out from the centre is one of the contestants from the Miss Vietnam competition who were being subjected to a photo shoot there. For a closer look, at the talent, log into the 'Peoples of SE Asia' page. We enjoyed several days in and around Hoi An, both on the river and at ancient sites like My Son about 30km away where temples built by the Champa peoples from the 4th to 13th century had been discovered in the late 20th century by the French army and recovered from the jungles. They were constructed of brick but sadly had sustained a fair amount of damage when they were targeted by the US Air Force. From there we took an overnight sleeper bus to Nha Trang. This was thankfully our one and only journey of this type. Not only were the beds constricted with no space for other than one body but the state of the roads and constant blaring of the horn made sleep almost impossible. Nevertheless, we arrived intact in good spirits and set about exploring the seafront. 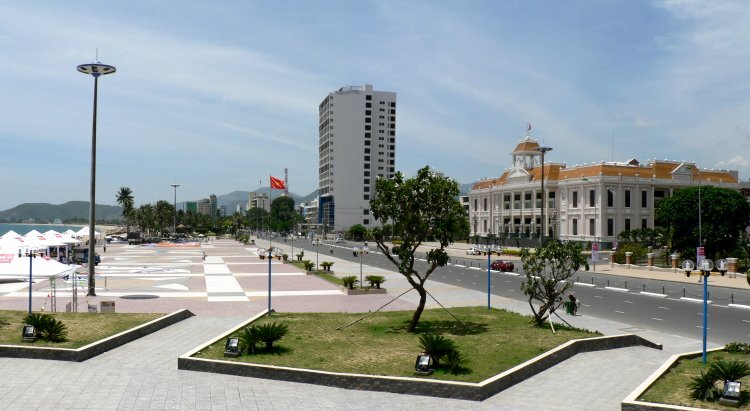 This resort town could have been in any of a hundred developed countries. Our walk along the shore to the north took us to a creek that harboured the fishing fleet and a somewhat decrepid supporting village. 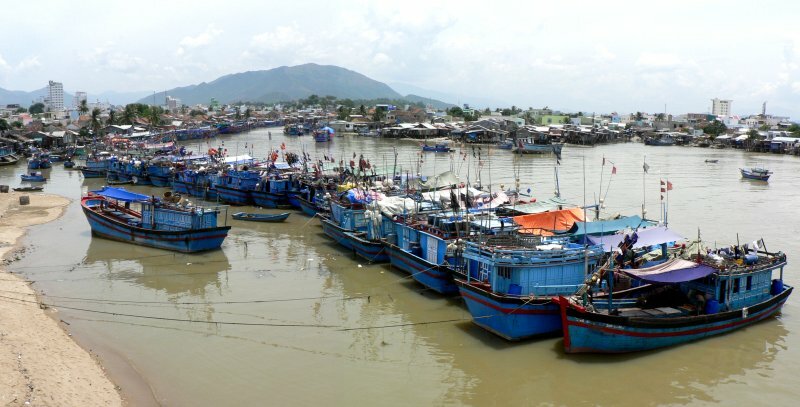 Being a weekend the boats were all in port giving us this colourful romantic vista of Vietnamese coastal life. That day is also memorable for the superb French seafood restaurant we found with splendid sea views from an airy open balcony. It was also the place we discovered all the kitchen staff asleep on the kitchen surfaces and deep-freeze tops as we left (see 'Peoples' page). 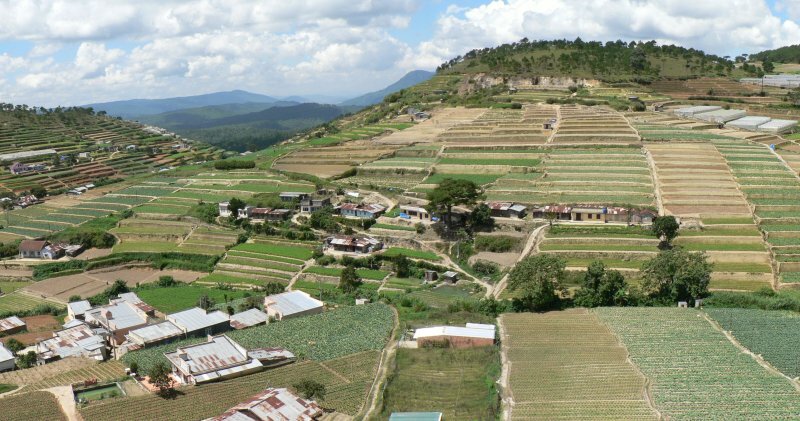 Our route then turned inland, climbing steeply into the highlands and the town of Da Lat. This was a very different place, with a cooler much more pleasant climate which instead of unending fields of rice was packed with market gardens. The area grew every sort of vegetable imaginable in intensive open fields or under plastic covers. This included coffee, tea and grapes, so all tastes were catered for though the wine we tried was a little 'basic'. A visit to the market there was a revelation by any international standard. The town also boasted the oldest train station in the country, now reduced to just two tourist trains a day. Their destination was to the little town of Traimat 7km away. Here there is the splendid Wat Linh Phuoc with a tall associated pagoda, which we climbed. Vietnam is a long narrow country about 1300 km in extent from top to bottom and we had booked a so called 'open ticket' for the bus journeys from Hue southwards. Like so many things in this rather unpredictable land, what you are offered and what you get are often significantly at odds. This journey of around 360km was our worst of the whole trip as the clapped-out coach driven by a very suspect driver, laboured for ten hours, often being passed by lorries, motor scooters and even pedal cycles on some inclines. Entering Ho Chi Minh City, known more commonly by its old name of Saigon through the traffic of the urban sprawl is a protracted business. This was alleviated though as we passed a couple of kms of concentrated plant hire companies with all the crane jibs erected to advertise their presence. 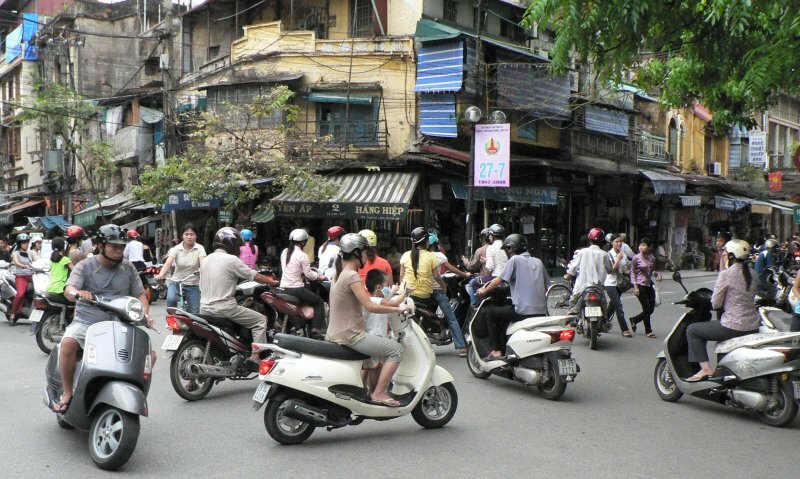 Saigon is a vibrant place where the level of traffic in the central city raises serious problems for anyone on foot who needs to cross a road. 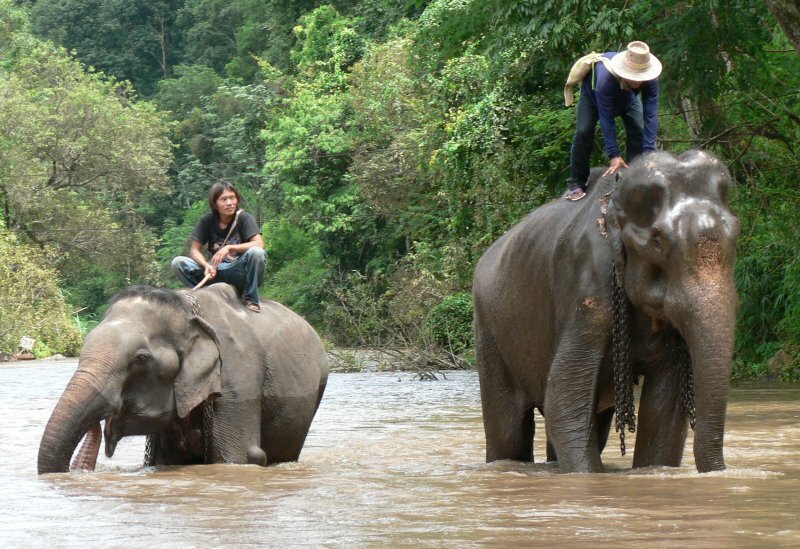 Not many people actually try, preferring to get around in taxis, tuk-tuks or bicycle rickshaws. In Hanoi there is a similar level of predominately two wheeled traffic but at least there they do make an attempt to avoid you. Not the case in Saigon where they seem dedicated to spoiling your day! 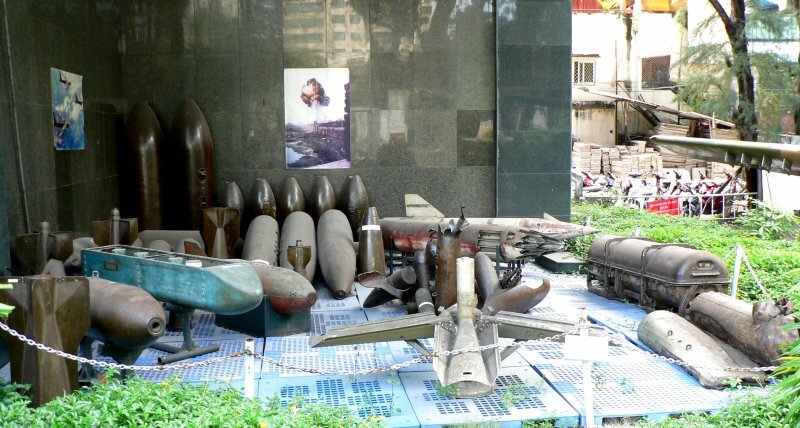 There is not really a lot for the tourist to do there after you have been to the Independence Palace, Museum of the History of Saigon and War Remnants Museum. There is of course the famed rooftop bar of the Rex hotel where the US officers hung out where you can get a very overpriced but excellent cold Tiger beer. The newly completed war museum is very impressive and thought provoking. Not only is there a mass of beautifully preserved US hardware on show including fixed winged aircraft, helicopters, tanks, field guns, bulldozers, etc, etc but also sections dealing with every aspect of the Vietnam war from press coverage to overseas demonstrations. By far the most frightening element is the story of the use of and experimentation with prohibited chemical weapons. According to US data for the period 1961-71 their air force sprayed around 100 million litres of toxic chemicals in Vietnam, including 44 million litres of the defoliant Agent Orange containing large quantities of dioxin, which caused immense immediate suffering and is even now leading to very high levels of birth defects. International studies have estimated that over 4.8 million people have been seriously damaged by exposure to these chemicals! 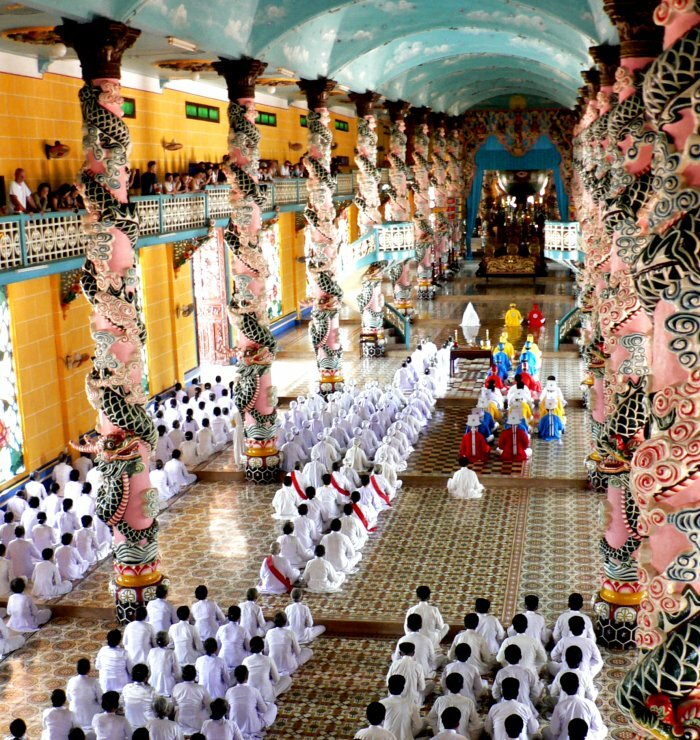 We took a day trip 105km north of Saigon to the town of Tay Ninh near the Cambodian border where we visited the centre of the Cao Dai religion. This syncretic sect is a blend of Confucianism, Daoism, Buddhism and Christianity. It was formed in 1926 by a Vietnamese guy called Ngo Van Chieu and is thought to have a worldwide following of upwards of 3 million adherents. Both the temple exterior and internal decoration were quite amazing, as was the noon mass which we were allowed to observe from a balcony. The novices of the sect wear white robes whilst the priests and more senior members are in more colourful garb. Our lasting impression of this place was a very visual one, somewhat akin to experiencing live a lurid scene from an Indiana Jones movie. After lunch we backtracked to the Cu Chi Caves, a tourist re-incarnation of part of the 250+km of tunnels dug by the Viet freedom fighters to capture Saigon and oust the US. We got to crawl along a 200m section enlarged to about twice original size for tourists but even then Dave had difficulty getting his shoulders through. It was also uncomfortably hot down there but we guess if you are defending your life, family and homeland from an aggressive invader it would be the least of your problems. Rather than take the usual bus, we chose to make our way from Vietnam to Cambodia by boat up one of the many flooded arms of the Mekong river that course through the delta region. It was all at a leisurely pace and we got to visit some of the islands in the lower reaches. Our final experience of Vietnamese commercial 'zeal' came at the border post whilst the paperwork was being prepared when we were directed to have lunch in a typical grass-roofed local restaurant. About thirty of us from the boat were offered blue menus with prices quoted in US$ which appeared to be 3-4 times the price of the descent establishments of Saigon. A little perplexed, as we had expected to off-load our limited supply of Dong currency, we checked another place just round the corner that were offering the same fare at normal prices in Dong. So, we upped camp only to find that all the blue menus were rapidly replaced by white ones at you can guess what prices. By this stage we had had enough of being continually ripped off, so with others we left on a matter of principle. That we are afraid is Vietnam. They thought that foreign visitors are there to be robbed by whatever means; many appeared to believe they were still in the war reparations mode! Cambodia which we entered by a short coach trip to Phnom Penh, the capital is a much different place. Having heard about Pol Pot and the killing fields we were prepared for a much grimmer environment than we found. The infrastructure of roads, electricity supplies, etc was much improved and the people far more open, friendly and honest. 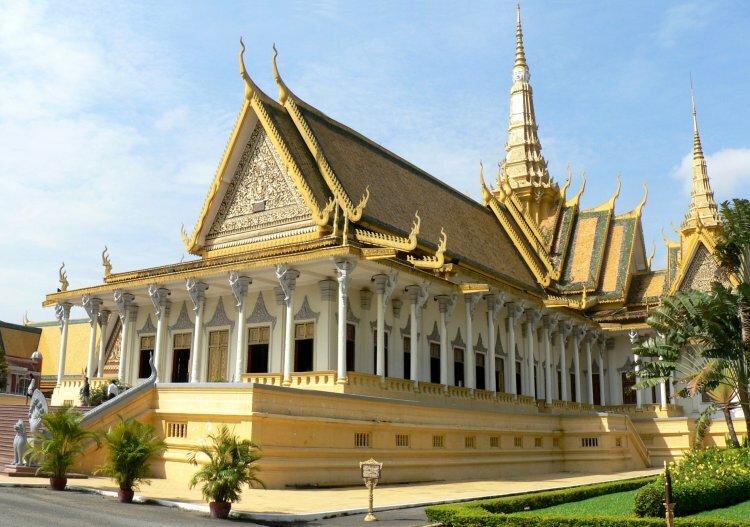 The must see place there is the Royal Palace built in 1866-70 which is resplendent with the most perfect architectural examples that one can probably see anywhere in SE Asia. Magnificent buildings, temples, tombs and sculptures everywhere within a compound about half a km square; even golden throne rooms and temples with silver floors, its all there. 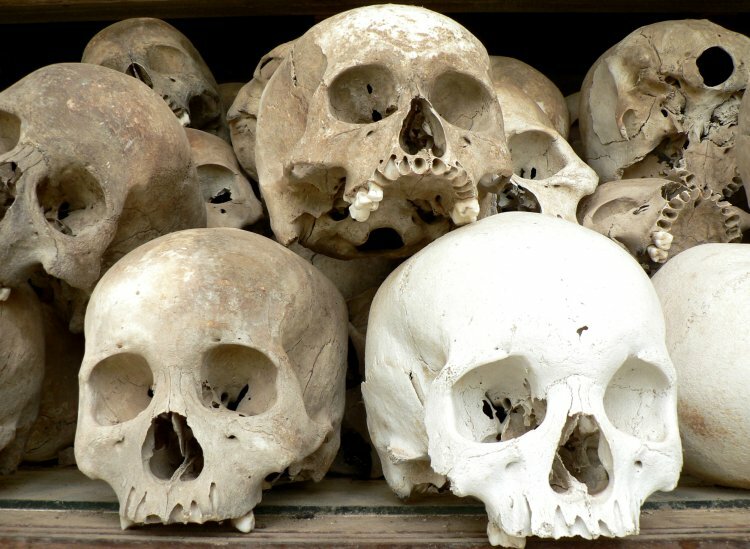 It is impossible to visit Cambodia without being made aware of the atrocities of the Pol Pot regime of the mid-70's. It would appear that whilst a contemporary of dear old uncle Ho Chi Minh at Paris University, this particular leader decided to take a short-cut to the ideal communist society using the most draconian measures imaginable which resulted in the massacre of over two million of his people. All officials, officers, leaders, the skilled and anyone with a semblance of education were targeted first, with the populace ejected from the cities and towns to forced labour in the fields with heads bowed and instructions never to look-up. We visited the infamous S21 Genocide Museum in an old secondary school just outside the centre of the city (name derived from Security, 2nd district and Pol Pot brother #1). Here they detained, interrogated and tortured thousands before sending them to be butchered by having their heads beaten in by a variety of blunt instruments such as the heads of hoes. The sculls below are some of the hundreds preserved at the Killing Field Memorial just outside the town, surrounded by the shallow pits that the bodies tumbled into after being dispatched. It hardly seems credible that this could have happened so recently. We really liked Phnom Penh, especially as we knew our tour was about to end on a magnificent high with the temple complexes around Siem Reap. We were not to be disappointed. The coach trip between the two cities was pretty uneventful, aside from the fact that no one told us that the stop at around 10.30 was meant to be the lunch break. We arrived at 4pm tired and hungry! That was all dispelled when we found we could buy our 3 day, US$40 pass and view the legendary Angkor Wat from the nearby hill top of Wat Bakheng that very evening. Life doesn't get any better! 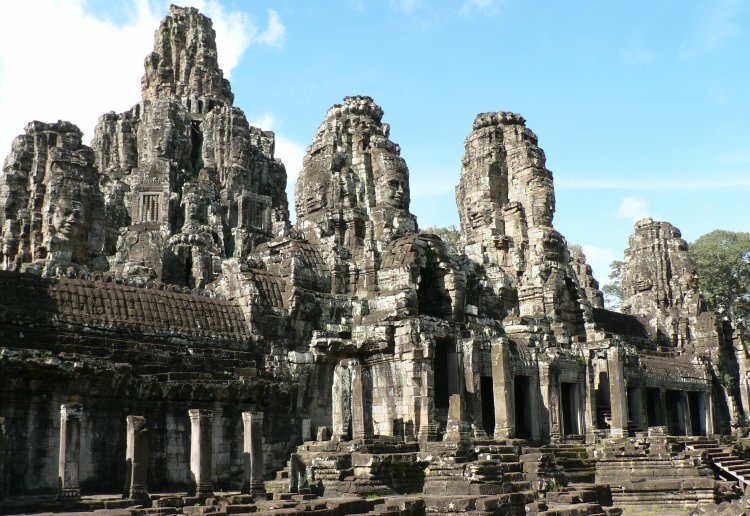 The form of the structure of Angkor Wat symbolises the Hindu universe, the surrounding moat representing the mythical oceans, the succession of concentric galleries the foothills of the sacred mount Meru, home to the gods and the towers representing the mountains peaks. Vishnu the protector, the god who preserves universal order was the prime focus of this temple but it remains unclear how much the ancient Khmer peoples who built it really adhered to the Hindu traditions they had imported. Next day we were off at 'sparrow fart' on the first of three days of magical exploration where our seven weeks of wating training was to stand us in good stead. It is almost impossible to describe the elation experienced viewing these magnificent structures which are unique in the whole world. There are dozens of major temple complexes within a few km and we got to explore eighteen of them in some detail. 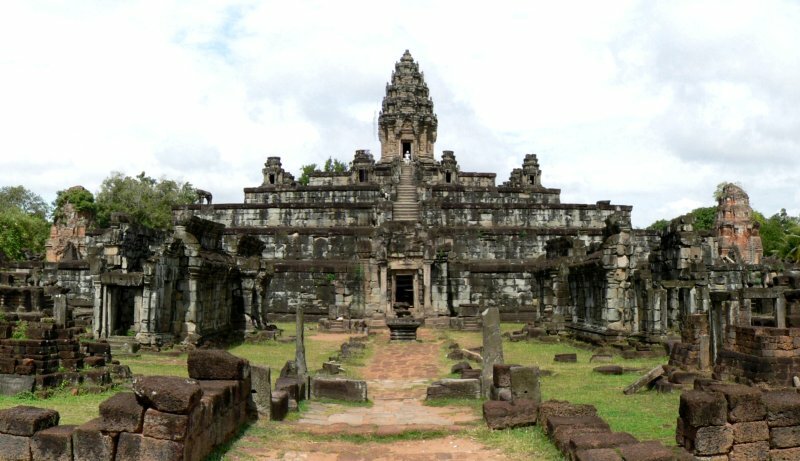 The Angkor Wat temple built between 1113 and 1150 is probably the most significant because of its completeness but it is difficult to choose what to show you from the 180 or so images we have of that site alone. Certainly the friezes as much as the structures that house them are amongst the most important. One of the over 2000 apsaras in this temple alone must command a high priority (well proportioned celestial dancers). The outer colonnades of the temple house over 600m of the most amazing bas-reliefs or friezes, about 2m high which are mainly inspired by the Hindu epics from the Ramayana and Mayhabharata. 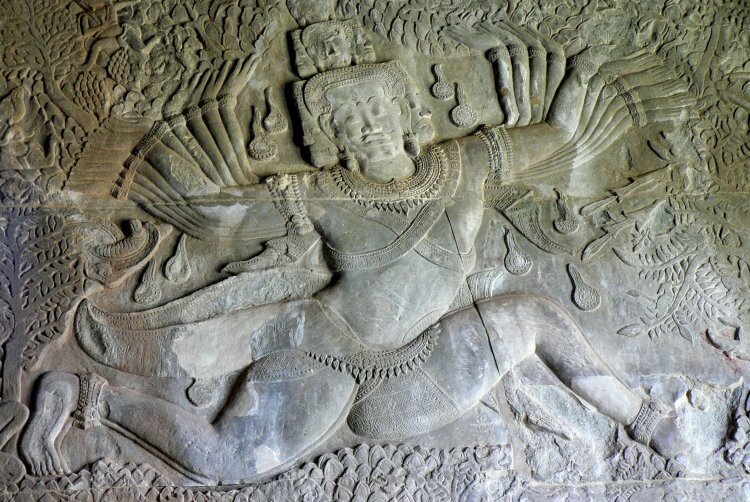 The former is the best loved and most widely told of all Hindu legends, being a classic tale of the triumph of good over evil which was very popular in SE Asia. We have around 70 images of these so choosing a single one was difficult but below is the god Ravana in the process of shaking Mount Kailasa. It took a very intensive but ecstatic four hours to view Angkor Wat, so after a much needed lunch break we moved on to the next most significant temple, the nearby Bayon which was constructed around 1200 as the state temple of king Jayavarman VII. Uniquely, it uses a mass of face-towers with 216 faces to again create a stone mountain of ascending peaks. Most of the towers display four faces with the central tower having many more but today only 37 of the original 49 towers remain. For two full days we concentrated on the main congregation of buildings close to Angkor Wat but on our last day we travelled around 30km east of Siem Reap to the Roluos group of three major temples. These pre-dated the main site by a couple of centuries, Bakong below having been constructed in 881AD. It was dedicated to the god Shiva whose main cosmological role is as the destroyer, bringing each world cycle to an end with his dance of destruction. This was the first significant temple mountain with the five tiers of its pyramid again symbolising Mount Meru. 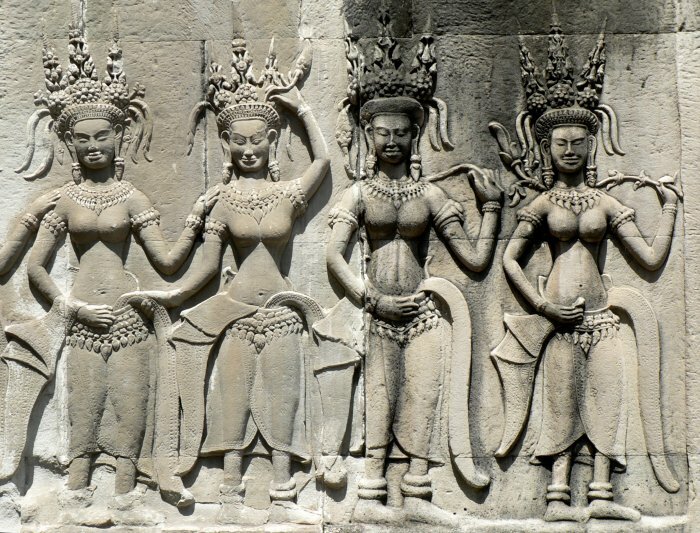 Across the centuries the three building materials of choice used by the Khmers were brick, sandstone and laterite. The latter is an iron-rich clay found widely in SE Asia that has the property of being soft to mine and shape but hardens with exposure to sun and air. Unfortunately it has a deeply pitted surface in its mature form so is reserved for hidden parts of a structure and faced with stone or brick on the outside. The lintel below from Preah Ko, another of the Roluos group is amongst the most decorative we saw. The god Garuda in the centre holds garlanded strands which terminate in a five headed naga (snake), the whole being backed by loops of vegetation. 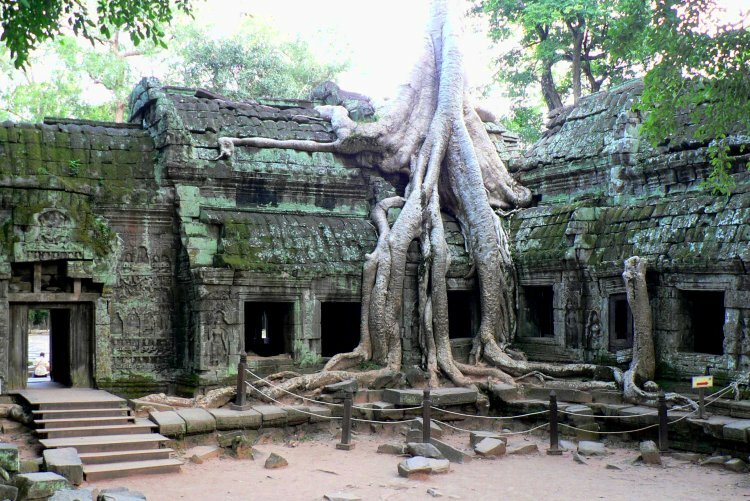 Though the Khmer people used many of the temples to varying degrees over the centuries, many were lost to the all pervading jungle. The French naturalist Henri Mouhot is credited with bringing about an awareness of them in Europe when his posthumous notes were published simultaneously in London and Paris in 1863. With some sensitivity the conservers have over the years left some of the monuments wreathed in their passionate embrace with nature. These are three examples that we couldn't resist. We reached Ta Prohm late on our second day of temple exploration, as the harsh mid-day sun had given way to the softer glow of evening. It was also deserted which further enhanced the pure magic of the atmosphere that is so apparent in the picture below. From many points of view this image epitomises the unique beauty of these most wonderful of ruins. 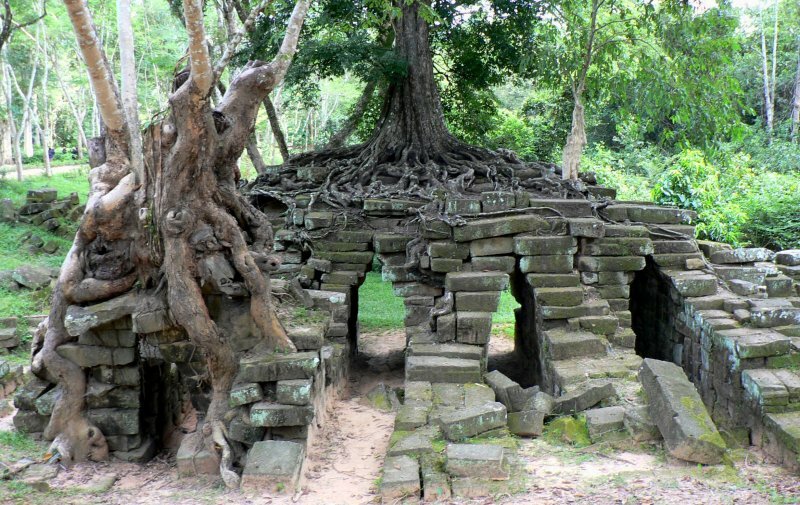 The third and last of the nature rampant series was taken at Ta Som that owes its charm to a combination of remoteness, semi-ruined state and face towers. 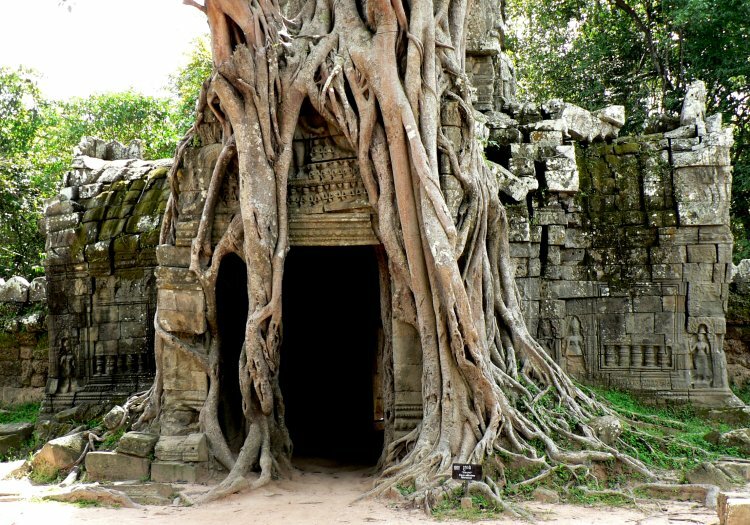 Our return to Amoenitas from Siem Reap was accomplished by air via Kuala Lumpur so quickly that it left a wonderful feeling to have left those wonderful temple behind to be back aboard within the space of 24 hours. It just makes you want to get off and return again someday soon. This first year in SE Asia with the mix of travel by land and sea has proved to be most enjoyable. We still do not have any hankering to return to Europe, in fact the economic news, not to mention the unsettled state of the seaways off Somalia makes staying on here an even more attractive prospect. 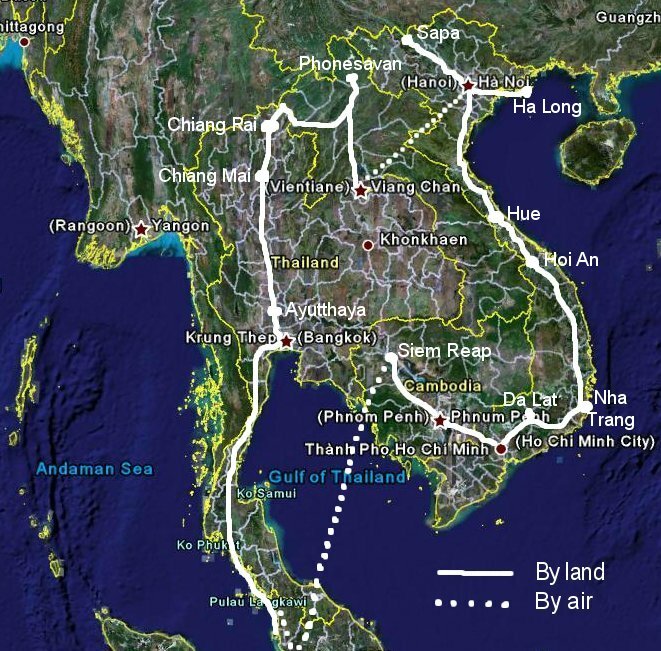 The plan at the moment, in so much as we have one (we pride ourselves in only having one plan ; that is not to have one) is to return to the Phuket area of Thailand for Christmas then take-off later in January for the Andaman Islands about 350nm to the NNW. These are part of India and along with the Similan and Surin Islands on the way, should provide some excellent diving opportunities. We would also like to explore China, Tibet and Nepal sometime around September and October next year as well as a further visit home to see family, friends and particularly our three grandsons. Paul our younger son and wife Emma are expecting a second child in March which is yet another strong incentive.